The Pat Cairo Family Foundation, Inc. was organized in 1995 to help those struggling with Cancer. Pat was treated by Carolyn Runowicz, M.D. at the Albert Einstein College of Medicine/Cancer Center from the onset of the disease in late 1989 until 1994. Pat spent approximately three months before her passing in March of 1995 at Calvary Hospital which is an acute care specialty hospital serving advanced cancer patients. Since our inception in 1995, The Pat Cairo Family Foundation, Inc. has donated more than $4,000,000.00 to help those struggling with cancer. Each year through our Annual Dinner Dance held on or about March 4th, Pat’s birthday and our Golf Outing held in the latter part of July, funds are raised which are then divided equally and presented to Dr. Runowicz, the HERA Foundation and Calvary Hospital. Carolyn Runowicz, Pat’s oncologist at Albert Einstein, is the Director of HERA Foundation. She went on to serve at St. Luke’s-Roosevelt Center and last year accepted a position as Director of the Oncology Signature Program and Director of the UConn Cancer Center at the University of Connecticut. Dr. Runowicz is establishing the Pat Cairo Fellowship in Oncology at the University of Connecticut Cancer Center. The funds we present Dr. Runowicz will continue with the training of young physicians and research in the field of Oncology. She will serve as the President of the American Cancer Society in 2005. 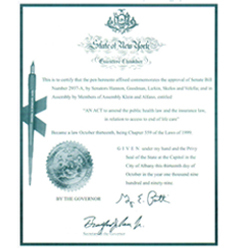 Perhaps our Foundation’s greatest achievement came on December 22, 1999 when New York Governor George Pataki signed into law an End of Life Care Billwhich ensured quality end of life care for thousands of terminally ill cancer patients. Specifically the law requires insurance companies and HMO’s to pay for treatment of terminally ill patients at acute care specialty hospitals. Since the Bill’s passage, hundreds of cancer patients who otherwise would have been denied coverage for admission and treatment at Calvary have spent their final days being cared for at Calvary. 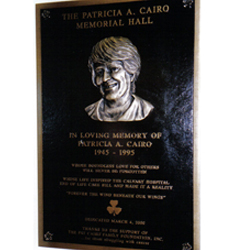 In recognition of the Foundation’s efforts, Calvary Hospital, on March 4, 2000, named the third floor south wing of the hospital “Patricia A. Cairo Hall”. Only once more in its 104th year history has Calvary Hospital so recognized an individual.